The new SimpliFiber Pro Optical Power Meter and Fiber Test Kits are the best “go-to” kits for anyone involved in first-line optical fiber cabling installation and verification. 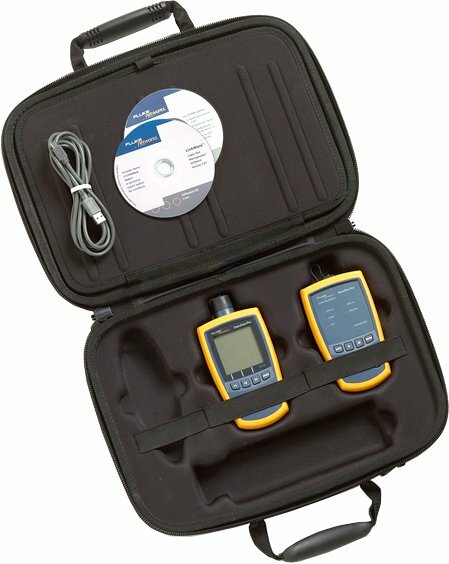 Whether you are a fiber technician or contractor, our expertly configured kits contain all the tools necessary to quickly measure loss and power levels, locate faults and polarity issues, and inspect and clean connector end-faces. Industry-leading features such as single-port dual-wavelength testing and auto-wavelength detection, combined with time-saving capabilities such as CheckActive™, FindFiber™, and Min/Max make SimpliFiber Pro the best fiber test kits on the market. A system approach SimpliFiber Pro is a product suite that allows you to match products and functionality to your needs. SimpliFiber Pro is made up of four unique fiber platforms: the power meter, the multimode source, the singlemode source, and the FindFiberTM Remote ID source. Each platform has uniquely competitive features, bundled in convenient kits, to meet the needs of today’s technicians. The optical power meter is included in all kits and is calibrated for accuracy at six different wavelengths (850, 1300, 1310, 1490, 1550, 1625). The meter features the ability to save a reference power level, allowing a direct display of fiber loss. It also has an intuitive four-button panel, a large LCD display screen, and a serial port. The meter’s single connector permits simple network connection and straightforward reference power measurement. Interchangeable connector adapters are available in the most popular connector styles. Power Requirement) 2 AA Alkaline batteries.